This is a whisky that I've been very interested in, and not just because my last name happens to be French. Distilled in Cognac, France, matured in new French Limousin oak barrels and finished in young Cognac casks, Brenne (DrinkBrenne.com; @BrenneWhisky) sounds like the French version of a Scotch sherry bomb. Before I get started, a big thank you to G-LO (@boozedancing) over at "It's Just The Booze Dancing" blog who sent me this sample of Brenne. Currently, distribution of Brenne is limited to the New York area (you chaps across the pond can't even get this yet) and allocation capped at just 30,000 bottles a year. A small batch production, Brenne is made at a farm distillery that has been producing Cognac since the 1920's. Located on the border of the Bordeires and Fin Bois growing areas in Cognac, France and owned and operated by Allison Patel (@WhiskyGirls), Brenne began making Single Malt whisky — from seed to spirit — starting in the early 2000's; but released their first bottling in 2012. Brenne whisky begins life as two types of locally grown, organic, barley — Vanessa and Prestige. According to Allison, the chalk in Cognac's soil lends a unique Ph balance to the barley crop which assists in the production of a very smooth distillate. In addition to affecting the grain, the chalky soil also helps to retain water and reflect sun light, both of which helps to ripen the crop. Using yeast strains typically used in the production of Congac, and water sourced from nearby Charente, the malted barley (Brenne uses an off-site malting facility) ferments at cooler temperatures, which takes longer but, according to the distillery, extracts a more complex structure from the grain. Brenne is twice distilled using copper alembic stills producing a new make at around 70% ABV, which is then taken down to a barreling strength of 59% ABV. Brenne's unique terrior and production methods don't end with its Cognac inspired yeast or chalk-infused soil, it continues as each batch of new make is barreled in new French Limousin oak (light char, heavy toast) and made to rest for 5 years. The whisky is then moved into ex? ?Cognac casks (also Limousin oak) for an average of 2 years — the finishing varies depending on how long Cognac was in the barrel prior to the whisky. So, how does the infusion of Congac production techniques work when applied to whisky? 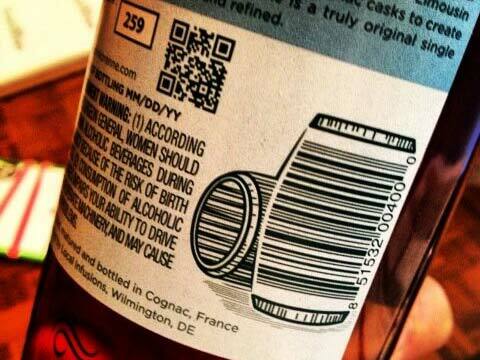 It's the little details that matter — Brenne's UPC code design is a great touch. Photo credit: @franklywines. Immediately the nose comes alive, assailed by a bountiful bouquet of sweetness and a cornucopia of fruit. There are many aromas mingling in this whisky, and it takes time to appreciate the variety. In fact, the nose is so rich with fruits that if I didn't already know this was a single malt I would have sworn it was a blend. Stone fruits dominate — peaches and apricots — surrounded by lemon zest, brown sugar, almonds and a hint of licorice. Steve Prentice, of the Somerset Whisky Blog (@steveprentice), remarked to me one night that the nose is like sticking your head in a bag full of jellied fruit candy, and he's right on the money. The candied sweetness is undeniable, but it's a balanced grouping that plays with, not over, the fruit. Past the delightful gathering of sweets, the oak strolls by nearly unannounced; an older, more refined bit of oak, striding just behind a waft of vanilla. This isn't a new American White Oak barrel, it's something far more unique. This is a very light whisky, crisp and smooth with little-to-no alcohol burn. In fact, this whisky is so light that if you hold it on your tongue you'd think the liquid was water rather than spirit. As the whisky begins to work its way across the palette — the majority of it concentrating on the center of the tongue — it brings a wonderful tart/sweet note of raspberries and creme with a dash of brown sugar and figs. Delightful! Wait! Where did it go? Come back! Blink and it's gone ... [sigh]. While the fantastic collection of sweetness and fruits seem to arrive like a horse-drawn carriage strolling through the French countryside, they all but disappear as quickly as an Italian Super Car on the Autobahn; the finish is microscopic. However, there is a solution to this problem: drink more Brenne! 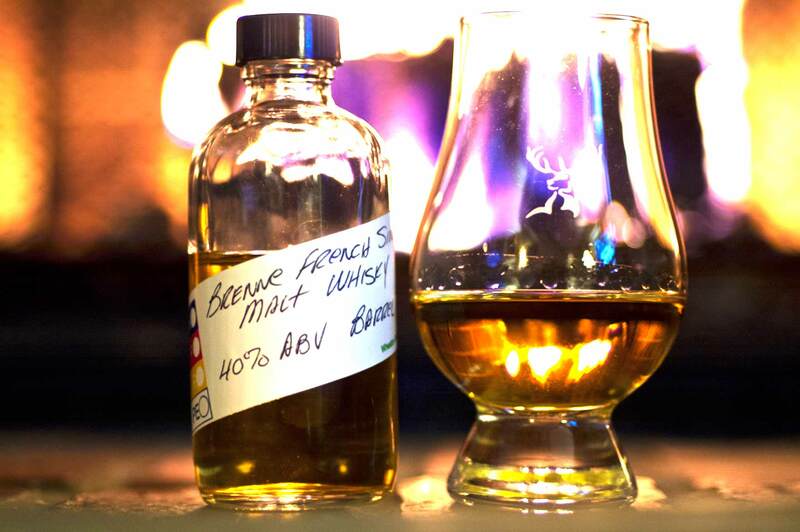 A dram of Brenne next to a warm fire — the proper way to review whisky during winter. I really like this whisky, it's light, sweet and fruity nature puts it on par with other spirits such as The Hakushu 12 and Balcones Rumble. The finish in Cognac casks added a great depth of sweetness which plays well with the whisky's stone fruits and light citrus notes. This profile led to a surprising discover when my wife — who's a Tequila connoisseur that doesn't like whisky — tried a drop, then proceeded to fight with me over the remaining sample! Finally, if I had to pick one thing that I was disappointed with — besides the quick finish — it's the bottling strength. At 40% ABV the whisky doesn't stand a chance if you add water or like your whisky 'on the rocks'. I hope there are plans for a future cask strength release. When I originally reviewed this sample I gave it a slightly higher mark, but after subsequent tastings — trying to coax out more of a finish — I decided on a mark of a solid B+. Cheers! (2013-03-03) An earlier version of this review incorrectly stated that Brenne was available in France; in fact, at this time, Brenne is only distributed to the US.